Multi-instrumentalist, composer, arranger and performance artist Jacob Venndt was born in Denmark in 1977. In 1997 he was accepted at The Royal Danish Academy of Music as an electric and acoustic bass player. The following year he was accepted for that same institution’s musician’s course for specially gifted students. The next significant step in his career was his acceptance for its two-year soloist class, one of the first few non-classical musicians to achieve this honour. And in 2006 he graduated with the debut concert “Venndt På En Tallerken”. Each of these four educational feats was adorned with the grade “A”. While attending the Royal Danish Academy of Music, he was an exchange student at The Trondheim Jazz Conservatory in Norway for one semester in 2001, and for six months during 2005 and 2006 he studied at the renowned Banff Centre of the Arts in Alberta, Canada. Jacob Venndt has been taught by prominent bass players such as Avishai Cohen (Israel), Marc Johnson (U.S.) and Richard Bona (Cameroon), Thomas Ovesen (Denmark) and Jens Jefsen (Denmark). As a composer he has been taught by Jørgen Emborg (Denmark), Lars Jansson (Sweden) and Butch Lacy (U.S.). His teachers in the art of performance comprised the renowned Danish actors Finn Hesselager and Viktor Markussen as well as the Swedish singer Marie Bergman. In 2001 Venndt won the The Danish Jazz Federation competition for upcoming young players with his band “Jacob’s Scrapbook”. In 2005 he received the Music Award of the Danish city Holstebro. He is featured on numerous CDs, and several with his own name in the headline. With his band Jacob’s Scrapbook he released “Jacob’s Scrapbook presents Circus Summerhat” on the label Music Mecca in 2004. And as a member of the duo Kwella/Venndt he released two CDs: “Kindred Spirits” on the Intermusic label in 2001 and “Odds and Ends” on the Olufsen label in 2004. In spring 2008 he will release to additional CDs. 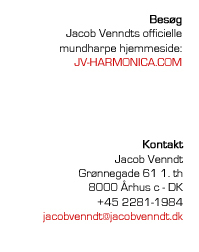 One as a debutant on the chromatic harmonica – “Jacob Venndt Group – From Denmark With Love” and one as part of the his duo-collaboration with pianist Pojken Flensborg. This is a “live”-recording and the CD will be equipped with the title “Party in The Piano Shop” and feature some more of Jacobs multi instrumental approach. Jacob has developed a taste for what he terms the “theatrical touch”. And in addition to this , he has created so-called “Performance jam sessions” mixing every artistic expression possible and has participated in various performance shows as both a musician and a performer. In 2003 and again in 2005 he created his own blend of performance, concert and happening in “The Story of Circus Summerhat”. 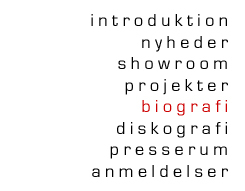 This play featured his own story-telling and music combined with the talents of the great actress Anne Marie Helger and the skilful and extremely creative visual artist Søren Behncke. In January 2008 Jacob was selected as a “Suzuki-Artist” by the great harmonica manufacture.